Cottage of 55 sqm in Garden Rez in a typical old house renovated, it can accommodate 6 people. 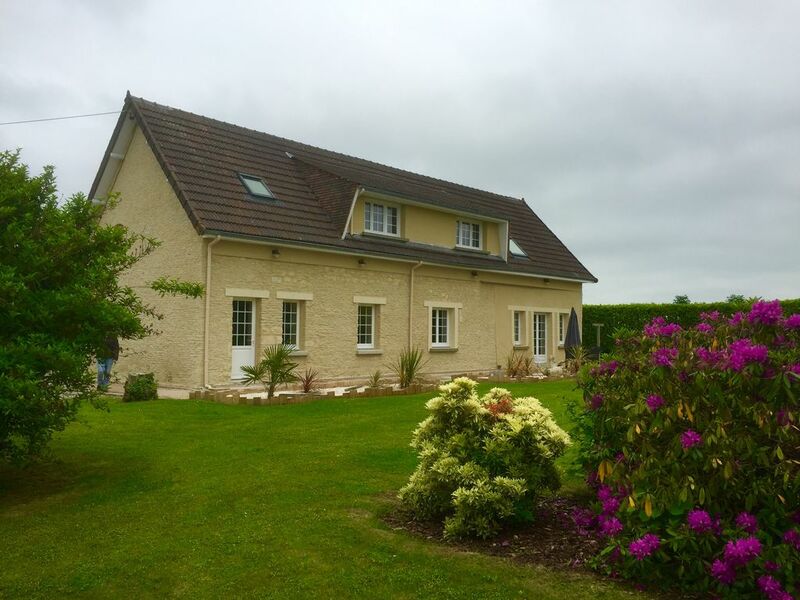 This home was clean, decorated and designed nicely, and provided everything you needed to feel comfortable during a stay in the Normandy region. Toys inside and outside for kids (including a playhouse and riding toys), kitchen supplies, etc. It is five minutes from Point du Hoc and a grocery store. One and a half hours to Montb Saint Michel. We stayed there with my sister and her family who stayed in the adjoining rental. Plenty of parking space right next to the house. The only thing I didn’t love about this place is that they charge an 80 euro cleaning fee (not included in the initial price listed)- that you don’t know about until you arrive- that if you don’t want to pay for, requires you to clean the whole house- floors, have dishes washed and put away, and sheets off. We did this because we didn’t want to spend the extra money on cleaning, but it would have been nice to know about it up front and factored a thorough cleaning time into our plans. Home was very clean and beautifully furnished. Used the grill in the evenings. Grocery close by was very handy. Perfect for Normandy beaches touring. Very nice house with great location! Very nice house with great location, especially for D-Day visitors. Everything worked well, merci! This half of a duplex was easy to find, close to Bayeux and the Normandy Beaches. The house itself is very comfortable and clean. The collection of kids toys were a hit with my grandson. The kitchen is well equipped. My family complained about the pillows but I thought they were fine. The cottage is close to a Carrefour and the fish market. My only suggestion would be some instructions on recycling. We didn't know we needed to keep the glass separate. I was more than happy to make up the beds myself. I once overheard a renter from a different website say she doesn't change the sheets if the guests only stay one night. Some extra bath towels would be nice especially with kids. Great home with a beautiful backyard. I would return. We could not have been happier. The cottage was beautifully decorated, clean, comfortable, and perfect. We have a 2 yr old that enjoyed the indoor and outdoor toys. It is conveniently located between the landing beaches. We would stay here again. The owners were very responsive before and during our stay. The apartment is spotlessly clean, stylishly decorated, well appointed and extremely comfortable. There is plenty of parking and it's easy to find. The owners responded to our request within a few hours and were easy to get in touch with. The house has a beautiful yard and an outdoor dining table. Everything from the pillows to the kitchen appliances is new. Thank you for being such gracious hosts. We will return when we can stay longer!